That movement is still some way short of the 270 votes needed. In the meantime, the Electoral College system continues to display one of the worst aspects of the now-discredited First Past the Post system that we used to have in New Zealand: namely, US elections are won and lost on a very small number of state contests that effectively decide the outcome for everyone else. 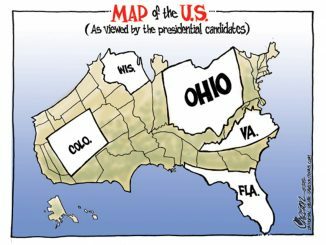 In the US, the same 14 “battleground” states decide election after election. They get the vast bulk of the campaigning and party resources, while the rest of the country is largely taken for granted. If you’re really worried about Russian hackers meddling in US elections, it really doesn’t help matters that the US has devised a voting system whereby the hackers need only concentrate their efforts on the handful of states that will decide the outcome. Here’s why. As Slate magazine recently reported, the real threat to the US isn’t Russia: it’s the political right, which is unfairly empowered by the American voting system. Paradoxically, as Americans converge on urban centres, those cities and populous states are becoming less important electorally, relative to the de-populating rural areas that – if the Electoral College system is not changed – will hold an increasingly lopsided amount of political power. In the process, the few will receive more power to dictate to the many – and by all available measures, the dwindling populations in those increasingly powerful rural and provincial voting areas will be disproportionately old, male, white and conservative.